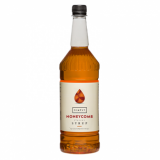 Monin honey (Miel in French) syrup in stylish 70cl glass bottle. Derived from the nectar of flowers, honey has a distinctive natural floral flavour which leads some people to prefer it over sugar and other sweeteners. Made with real honey with no added sweeteners, MONIN Honey adds the best of honey to all your beverages. Yet unlike regular honey, Monin Honey is specially formulated to dissolve instantly in hot and even in chilled beverages, for incredible versatility. Just pour and stir! Taste: Floral honey smell, sweet and smooth taste of honey candies; gives a more complex sweet taste to your drinks. Applications: Cocktails, coffees, teas, flavoured milks, smoothies. Can be used instead of Monin Pure Cane Sugar or Monin Gum syrup. Sugar, water, natural honey flavouring, acidifying agent: citric acid, preservative agent: E202.